Grado, one of the oldest family owned companies in the Audio Industry, and has been for over fifty-years been the leaders in the design engineering for the high-end audio and recording industries! Grado is famous for their remarkable headphone and phono cartridge designs and hold over 48 patents! The company's founder, Joseph Grado was inducted into the Audio Hall of Fame in 1982. Time honored manufacturing know- how and painstaking attention to detail allows previously unobtained levels of pitch control, harmonic accuracy and bass quality to be achieved. All Grado and headphones are handmade to Grado's full performance specifications! Nothing leaves the factory unless it sounds pure Grado! The Grado SR60i headphone's performance will astound you in its accuracy and musicality! 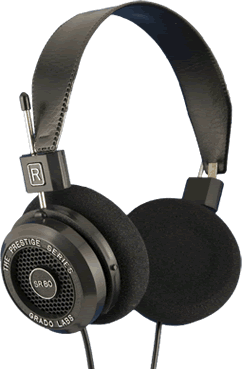 The SR60i will produce a sound that is pure Grado, warm harmonic color, rich full bodied vocals, excellent dynamics and an ultra smooth top end. With the SR60i you will notice improved control of the upper and lower range of the frequency spectrum with both better supporting Grado's world renowned midrange.Listen and Enjoy! It shows that you need not spend a great deal of money to obtain a level of performance and comfort that will outperform many other manufacture's headphone designs costing several times the price of the Grado SR-60i! As with their other models, the SR60i are hand assembled in the USA in Brooklyn New York! These headphones are a perfect pair of headphones for cost-conscious audiophiles, or for anyone looking to improve the sound quality of their portable MP-3 player or i-pod! 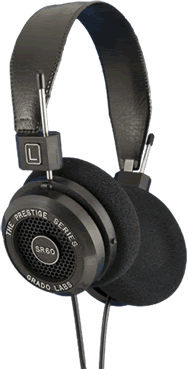 How does Grado improve on the performance of their fantastic SR-60i Headphones you ask? They take their headphone diaphragms and put it thorough a special "de-stressing" process, as well as, including a four conductor connecting cable, these all results in a more open soundstage and details in the music that will have you listening for hours on end! With the new, larger vented diaphragms of the SR-80i you will notice improved control on both the lower and upper ends and will produce a sound that is pure Grado! The SR-80i's provide warm harmonic colors, and rich, full-bodied vocals, excellent dynamics and an ultra smooth top-end to your favorite music! The SR80i will produce a sound that is, warm harmonic color, rich full bodied vocals, excellent dynamics and an ultra smooth top end. Listen and Enjoy! What does the "i" stand for the new SR-125i from Grado? Improved, that's what! Not wanting to rest on their laurels, Grado has again taken a great sounding pair of headphones and made them even better! The SR-125i has improved the driver's diaphragms by using a unique "de-stressing" process to enhance even the smallest details of your favorite recordings. Also the SR-125i uses UHPLHC (Ultra-purity, long crystal) copper voice coil wire in the diaphragms, as well as, the new 8 conductor headphone cable design. You will notice improved control and stability of both the upper and lower range of the frequency spectrum. This all results in a sound that is much more open and a beautiful tonal spread and balance of the music that will have you rediscovering all of your favorite music all over again! The top of the line in Grado's Prestige Series, the Grado SR325is has taken one the world's most acclaimed headphones and taken it a few steps further to enhance its performance! 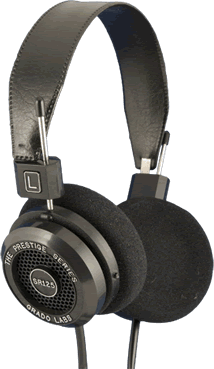 The 325is features improvements in both the drivers and the headphone's cable design. The way the SR325is drivers, cable, and metal housing move air and react to sound vibrations are now less affected by transient distortions. And with the new eight conductors cable design you will notice improved control and stability of the upper and lower range of the frequency spectrum with both better supporting Grado's world renowned silky midrange. 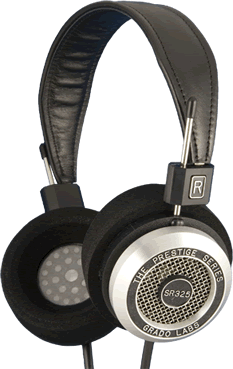 The Grado SR325is will produce a sound that is pure Grado, with warm harmonic color, rich full bodied vocals, excellent dynamics, and an ultra-smooth high end. Stop by The Stereo Shop and listen to a pair today and enjoy!